This entry was posted in Community & Education HKFP Lens and tagged photography Street Photography on December 31, 2015 by HongWrong. This entry was posted in Arts, Lifestyle & Events HKFP Lens and tagged photography sarah choi Street Photography on December 30, 2015 by HongWrong. This entry was posted in HKFP Buzz HKFP Venture Urban Exploring and tagged Sea Ranch on December 27, 2015 by HongWrong. 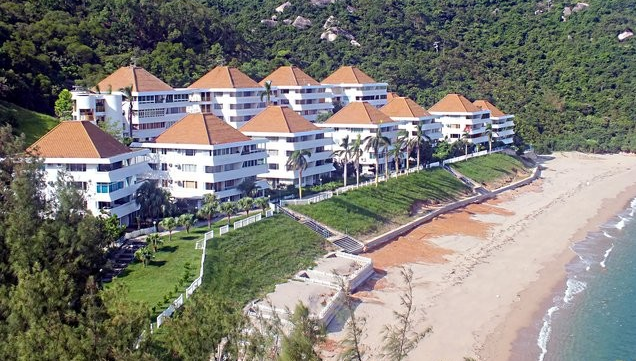 In an accessible area of south-west Lantau lies a 200-unit 1970s luxury resort called Sea Ranch. The eerie residential development was once described by Time Out as feeling “like visiting Discovery Bay after a direct hit from a neutron bomb”. The resort was completed in 1979, but accrued massive debt and was the subject of years of legal wrangling. Despite its notoriety, the self-contained enclave in Chi Ma Wan has quite idyllic surroundings and is visible to passengers on the Hong Kong-Macau ferry routes. There is now renewed interest, with several units undergoing refurbishment and more residents moving there, attracted by the secluded setting. This entry was posted in Environment & Health HKFP Buzz and tagged recycling Water on December 25, 2015 by HongWrong. Tired of buying bottled water in Hong Kong? 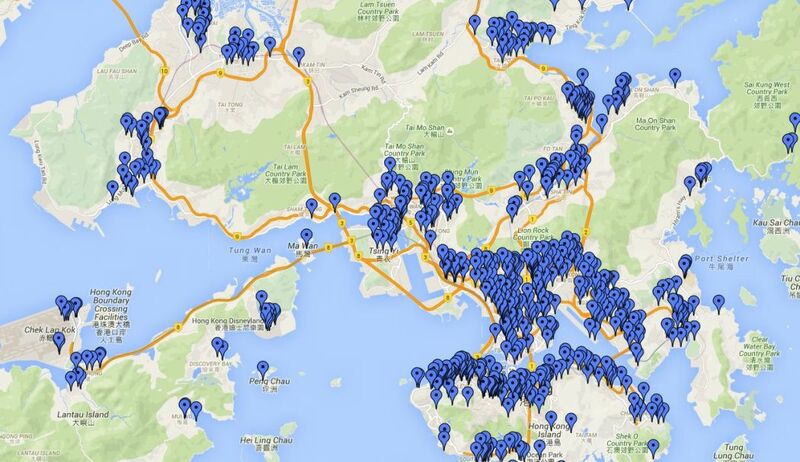 A mobile app which maps public water sources in Hong Kong is growing in popularity. Water for Free, a crowd-sourced online tool created by environmentalists, features over 800 water fountains and dispensers. If users discover a water fountain that is not listed, they can ask for it to be added. Rachel Pang of Go Green Hong Kong, the group behind the app, told HKFP that the app encourages citizens to bring their own bottles and refill them, instead of buying bottled water. This entry was posted in HKFP Buzz Video and tagged christmas Japan tokyo on December 23, 2015 by HongWrong. A Japan-based British man has won the hearts and minds of Tokyo residents by spreading some Christmas cheer in an unusual way. Joseph Tame, who runs a video and media business, dressed up as a Christmas tree, complete with flashing lights and decorations. “I like to make people laugh and smile where they don’t expect it… The reaction here on the streets [has] been amazing,” he told CNN. This entry was posted in Business HKFP Buzz and tagged Cards Against Humanity labour on December 20, 2015 by HongWrong. Card game manufacturer Cards Against Humanity has given its Chinese factory workers a week of paid leave as part of the company’s “Eight Sensible Gifts for Hanukkah” campaign. Customers paid US$15 to receive eight mystery gifts – one of them was a break for the employees at their Chinese printer firm. “The printer didn’t have any formal procedures for paid vacations, so we bought 100% of the factory’s capacity and paid them to produce nothing for a week, giving the people who make Cards Against Humanity an unexpected chance to visit family or do whatever they pleased,” the company said. This entry was posted in HKFP Buzz Video and tagged heliservices on December 17, 2015 by HongWrong. Graham Uden shares his video of Hong Kong as seen from above. 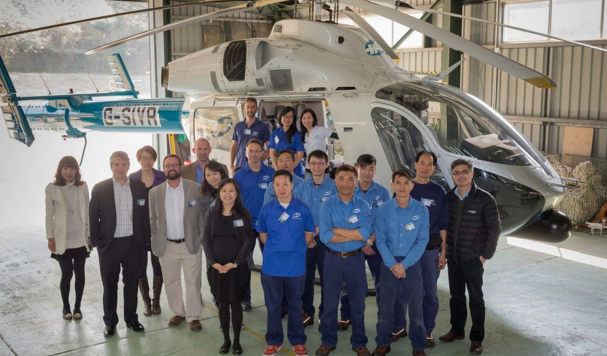 Uden shot the video on behalf of Heliservices – the sole and premier provider of rotary-wing services in Hong Kong. Heliservices offer sightseeing flights, VIP charter services, wedding, surveying, filming and photography services. Shared sightseeing tours start at just HK$1,999 per seat. Throughout January 2016, HKFP readers can enjoy a 5% discount on flights – simply quote HKFP2015. For a chance to win a free passenger flight between Kam Tin and the Peninsula hotel, buy a raffle ticket at HKFP’s Christmas fundraiser this Friday at Orange Peel, Central. This entry was posted in Arts, Lifestyle & Events HKFP Lens Politics & Protest and tagged Kevin Cheng lego OccupyHK photography on December 13, 2015 by HongWrong. This entry was posted in Arts, Lifestyle & Events HKFP Lens Video and tagged clockenflap music on December 2, 2015 by HongWrong. This entry was posted in HKFP Buzz Law & Crime and tagged chengdu Tan Qiao on November 20, 2015 by HongWrong. 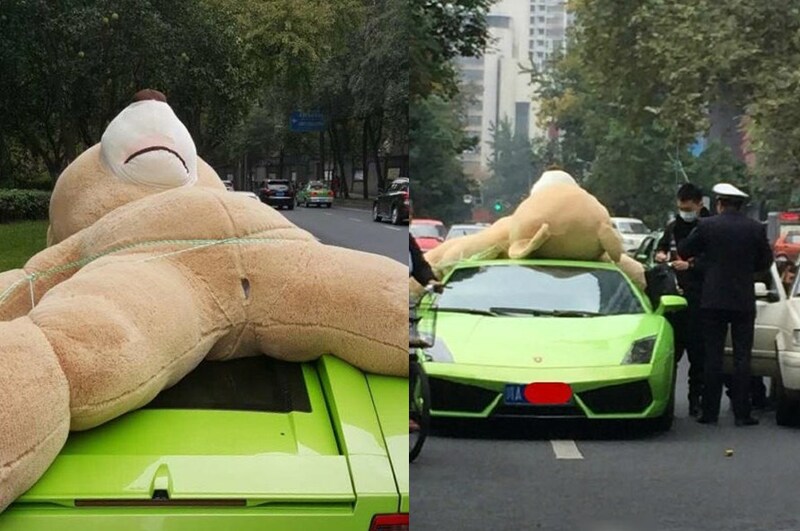 A driver in China was pulled over this week for strapping a gigantic stuffed bear onto his Lamborghini. 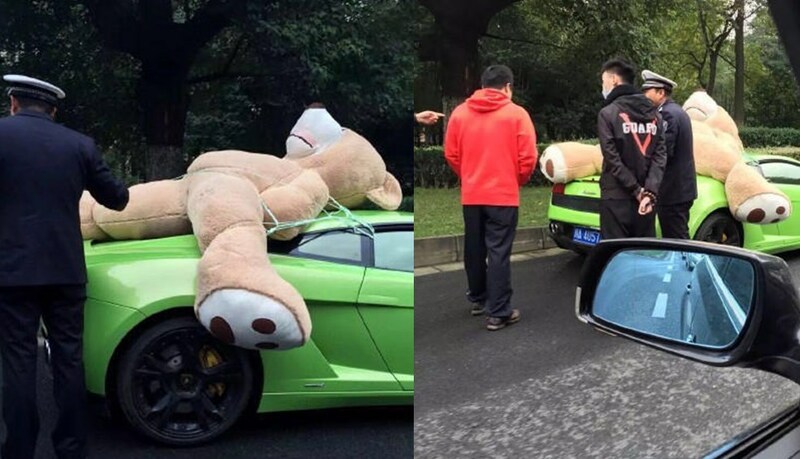 The man, who was stopped by Tan Qiao – a celebrity police officer in Chengdu, was apparently transporting the giant bear as a gift for his girlfriend. 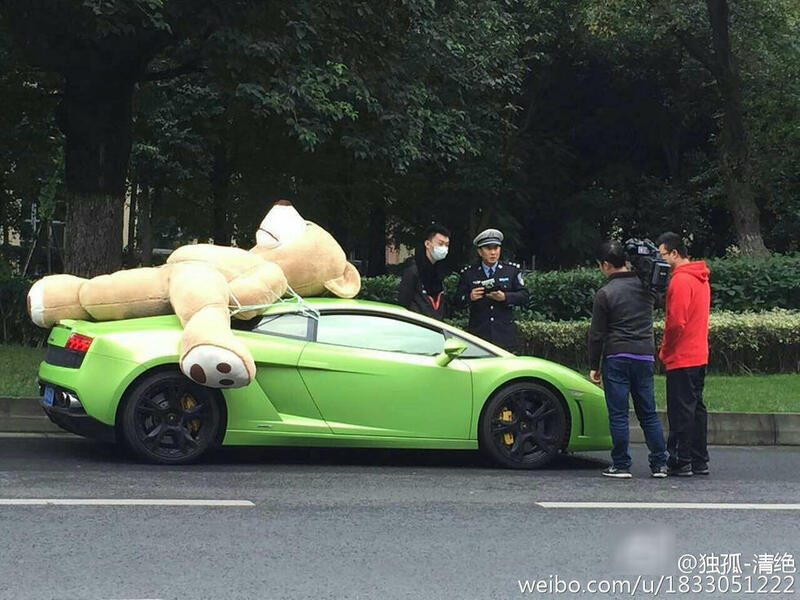 The bear was poorly secured and blocked the rear window, thus catching the attention of police and resulting in a fine.